Gill: The proposed Essex-Hudson Greenway would create a bike/walk path from Montclair to Jersey City, helping commuters to reach Manhattan. ESSEX COUNTY, NJ — If the long-heralded Essex-Hudson Greenway eventually becomes a reality, it may become an important segment on the September 11th National Memorial Trail, proponents of the project say. Earlier this month, Essex County Freeholder President and New Jersey Bike & Walk Coalition (NJBWC) board member Brendan Gill announced a collaboration between the NJBWC and the September 11th National Memorial Trail Alliance (NMTA). Gill previously said that the proposed greenway would provide walking and bike riding opportunities for residents of Montclair, Glen Ridge, Bloomfield, Belleville, Newark, Kearny, and Jersey City. Also, as the entire distance to Jersey City is only 11 miles, the greenway would provide a way to ultimately reach Manhattan (via PATH train or ferries) and points in northern New Jersey (via Hudson – Bergen Light Rail) for those who would like to commute by bicycle, Gill stated. For the project to become reality, however, the line would have to be purchased from its owner, the Norfolk Southern Corp., whose representatives have been icy about the idea and have contested the claim that the tracks are “vacant,” North Jersey.com reported. 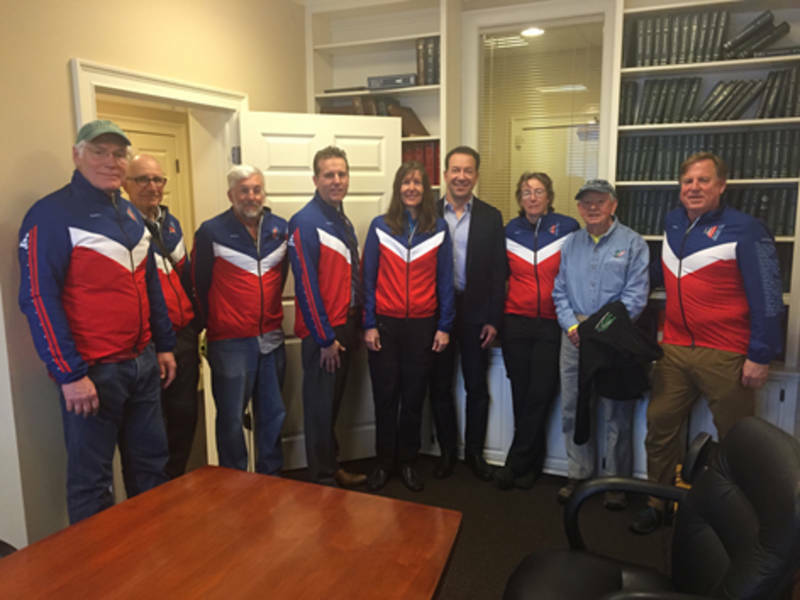 Recently, representatives from NJBWC and 911 NMTA took a break from cycling the full 1,350-mile 911 NMT route to visit Freeholder President Gill in Montclair and discuss the proposed greenway. “The September 11th National Memorial Trail Alliance is honored to be working with Essex and Hudson County to create a linear recreational and transportation opportunity for two of the most densely populated counties in New Jersey,” said 911 National Memorial Trail Alliance Board Chair Andy Hamilton. Hamilton said that 16 percent of the population of New Jersey would benefit directly from the proposed trail being built. “The impact on quality of life, health, and economics, along with the chance to remind people both young and old about the tragedies of September 11th, 2001, make this an amazing opportunity,” Hamilton said. Gill said that he and the NJBWC have worked to generate support for the project throughout the 11-mile alignment, including with the Friends of the Ice & Iron Rail Trail, Bloomfield Open Space Fund, Bike & Walk Montclair and other stakeholders along the route.